An Aging Global Population: 500 million people in the world today are older than 65. Dementia rates begin to rise sharply in this group after age 75. Increased Awareness of Cognitive Health Issues: Rising rates of ADHD, Autism Spectrum Disorder, and sports concussions require standardized cognitive screening tools to help with diagnosis and treatment. Advances in Technology Platforms: Portable cognitive screening is being enabled by tablet devices and internet access. 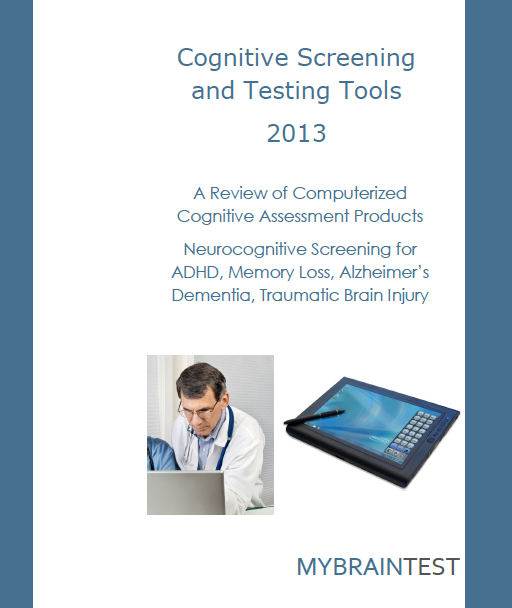 Representative companies and products include Cambridge Cognition (CANTABmobile), CNS Vital Signs, CogState (COGNIGRAM), HeadMinder, Medical Care Corp (MCI Screen), MedInteract (COGselftest), NeuroTrax (MindStreams), Psychology Software Tools (CAMCI), Screen Inc (CANS-MCI), Total Brain (WebNeuro), BrainFx, US Department of Defense, imPACT Applications.